Is there a better alternative to SQLight? Is SQLight really the best app in Developer Tools category? Will SQLight work good on macOS 10.13.4? 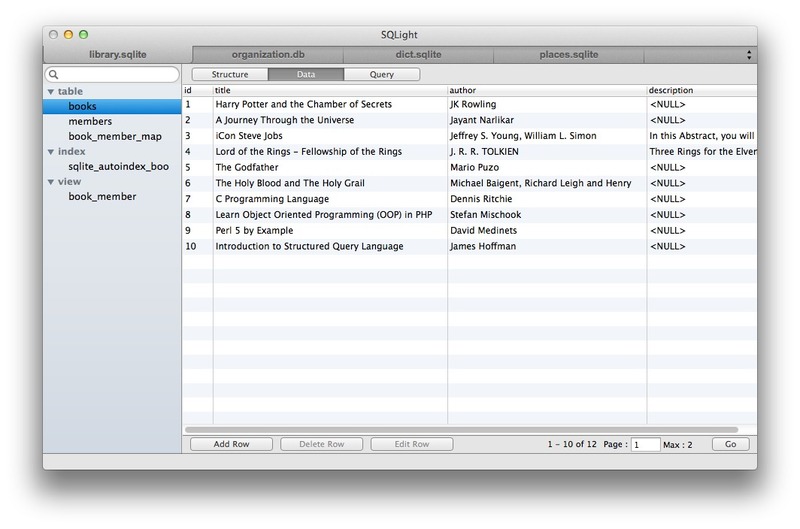 SQLight is an SQLite database manager tool. With this tool, you can browse, edit, delete data from local SQLite file with easy to use UI and controls. If you want to perform SQL query operation on database, there is a query box. Type your query and click the button to execute and get results. SQLight is totally free. No trial version, no demo version, you will get a fully functional application. Regular Updates: We already have planned and started working on features for next releases. Also there will be bug fixing as reported by our QA people and app users. Syntax coloring is implemented for SQL query. Quick look functionality for image, text and html cell data is implemented. Discard draft right click menu item should be disabled if no table draft is selected. Automatically check for update check box is not showing proper value. SQLight needs a review. Be the first to review this app and get the discussion started! SQLight needs a rating. Be the first to rate this app and get the discussion started! Beautiful looks and carefully designed, clean and neat layout: While designing SQLight we took due care to make it easy to understand and use. We kept it simple, neat and of course beautiful. You can see list of tables, views, indexes on left panel and right panel provides you controls to manage them. Use tabs to open multiple databases at the same time: SQLight provides tab feature (similar to what we have in web browsers). You can open another database in a new tab and can work on different databases at the same time. Save any data including BLOB from SQLite database: SQLight provides a feature that allows you to save any data e.g. CHAR, VARCHAR, TEXT, INT, BLOB etc. from SQLite database. Just right click on any of the cell to save contents as file. Features to make your task easy: SQLight provides you various keyboard shortcuts, right click menus to ease your task. 1) You can navigate between tabs with (Command 1), (Command 2) etc. 2) You can navigate between segments with (Ctrl 1) for Table Structure, (Ctrl 2) for Table Data and (Ctrl 3) for SQL Query. 3) You can rename a table just by selecting right click menu. Code updated to make compatible with Xcode 6. SQLight Crashes under OS X 10.8.5.